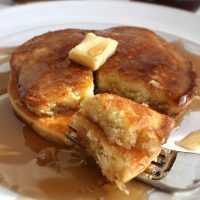 Thick, fluffy, and buttery keto pancakes! Only 2 net carbs per serving. If you miss real pancakes, then you will love these! Pancakes. Flap jacks. Hot cakes. Whatever you call them, one thing remains the same, pancakes are the ultimate breakfast food! 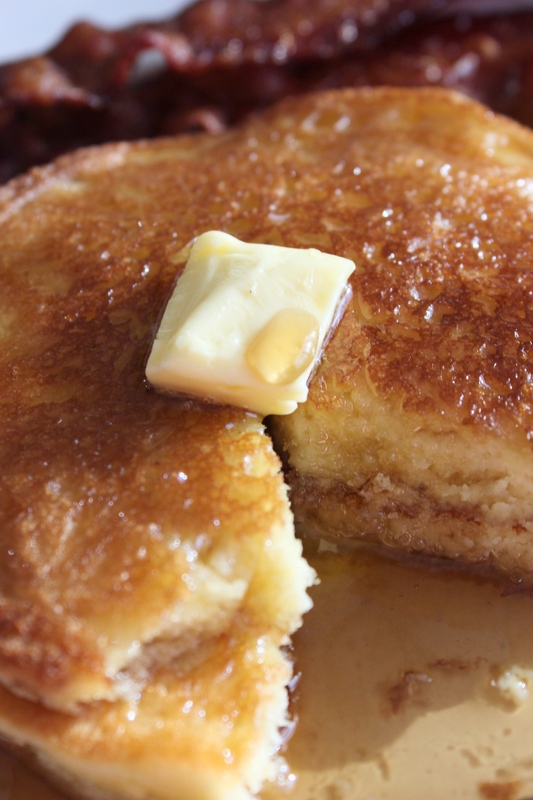 Fluffy, warm, buttery, syrupy pancakes…you really can’t beat it! But now you’ve stopped eating grains, carbs, sugar, and maybe even gluten. What happens to your beloved pancake breakfast? Are you really expected to live the rest of your life without another pancake? I’m here to save the day! My family loves pancakes. I tried a bunch of different recipes after we started eating keto and all of them were just…meh. They left a lot to be desired. 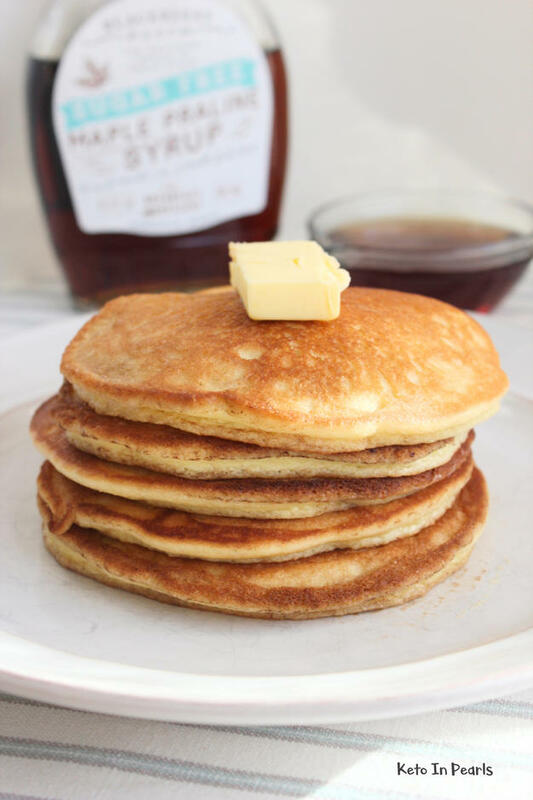 Don’t forget to grab a bottle of ChocZero sugar free maple syrup to go with your keto pancakes! Use discount code “ketoinpearls” for 10% off your entire order! And those cream cheese pancakes? I really don’t understand the fascination with those. Yuck! So for a year, yes a YEAR y’all, I’ve been trying to make the perfect keto pancake recipe. And by golly, I finally did it! 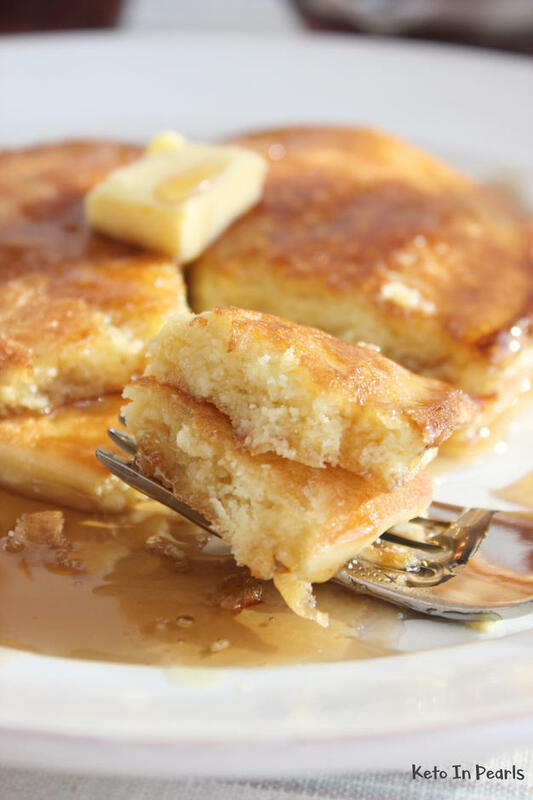 These pancakes are thick, fluffy, buttery, and so “real” you’ll forget your eating healthy! They’re not eggy or grainy or full of cream cheese. (seriously, why do people do that?) They’re just REALLY good! They’re so good, in fact, that my kids didn’t even know they weren’t the real deal! 1. You must use a blender or food processor to make the batter. You want it as smooth as possible. 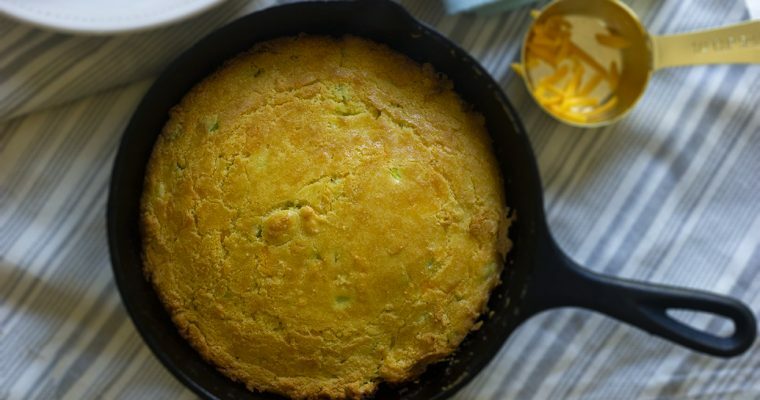 The absence of gluten eliminates the need to leave “clumps” in the batter. 2. I have been testing keto pancake recipes and methods for a year and this is the best I’ve come up with. With that said, I cannot recommend substituting anything in this recipe. If you choose to substitute flours or ingredients, you will not yield the same results. 3. These pancakes will not bubble up as their cooking. You’ll know it’s okay to flip them when the pancake can easily be moved without batter running over the sides. Mine took about 3 minutes for the first side and 1 minute for the second side. 4. The batter is very thick. If your batter is thin or runny, make sure you added everything the recipe calls for. Thin/runny batter will yield a crepe-like pancake. The thick batter yields a big fluffy pancake! 5. These pancakes reheat really well. You can make a double batch and freeze or refrigerate the extras. Store in a ziplock bag for up to a week in the fridge or a month in the freezer. 6. I’ve received a lot of questions about the nutrition information. This recipe makes 10 FULL SIZE pancakes. Yes, the serving size is 1 pancake. If you want less carbs or lower calories, just divide the batter and make smaller pancakes. You could easily do silver dollar sized pancakes for roughly half the macros. However, because these pancakes are keto (fatty) and don’t have carbs and sugar, 1 pancake will leave you full, especially if you’re eating eggs or bacon along with it. If you’re like me, I don’t eat lunch after a big breakfast so 2 of these would typically fit into my normal macros. Don’t let the numbers deter you! All text and images Copyright Anna Hunley for Keto In Pearls. Shares are encouraged and appreciated. Please share this recipe by sharing a link, not a screenshot. Copy/pasting full recipe text to websites or social media is prohibited. You may share an excerpt and/or single photo, provided that full and clear credit is given to Keto In Pearls with a link back to the original recipe. Combine all ingredients in blender or food processor. Let mix until fully combined. Let batter rest 5 minutes before cooking. Set a griddle (or nonstick skillet) to MED LOW heat. Use a 1/3 cup measuring cup to portion out pancake batter. Cook until edges are firming up. The pancakes will not bubble up like traditional ones but there will be little bubbles. Leftover pancakes freeze and reheat very well! I made these and they tasted great, however I only got 7 pancakes- measured them with 1/3 cup. Made them again and used a bit more water and was able to get 8. Does the brand of almond flour make a matter/difference? I measured everything to a t? Hmm…I’ve never not gotten 10 using a 1/3 measuring cup. If I use a 1/2 measuring cup I usually get 6-8. I don’t know that the almond flour brand would have a profound impact on the density of the batter. For what it’s worth though, I use Kirkland brand from Costco. Sorry I can’t be of more help! I made these a little bit ago and they are delicious. However, I made 20 cakes using the 1/3 measuring cup. My macros were different due to the different brand that I used but not that far off. Has anyone ever used Coconut Flour instead? I can only have 5 carbs per meal and this one has 8 per serving. I am fairly new to a LCHF/Keto world and have been looking for pancake recipes. I haven’t tried this yet but will soon. I just wanted to thank you for putting the disclaimers you have on this recipe. So often I see recipes on blogs/websites/Facebook that look great, have keto/LCHF ingredients but may not include any serving sizes or nutritional info. People rave about them as the :BEST low carb” recipe ever. Then I use Spark Recipes to calculate the nutrition and discover that the recipe is 14 grams of carbs, or some number that is too high for my liking. I guess everyone’s definition “low carb” is different. I just wanted to thank you for the disclaimers. I’m looking forward to trying this recipe. Just came across your website while searching for low carb meals on a budget & am thankfully excited! I have 2 Type 1 diabetics in my household & it’s hard to find recipes they”ll eat if it doesn’t taste like “the real thing”. Just wondering what brand of syrup you use on the pancakes? They look yummy & can’t wait to try! Hi Shellie! I use all ChocZero syrups! They’re really thick, the lowest net carbs, and no artificial sweeteners. You can use this link to use my affiliate code and save 10% if you decide to order. Their chocolate is amazing too! Just made these. They look beautiful and cook well. My 2 year old loved them. I suspect my husband would too. I’m firmly in the like camp. They taste pretty almond-y. My 8 yo didn’t like them. I’d say a solid 4 out of 5. This is the BEST pancake recipe!! I add sugar free chocolate chips and top them with whipped cream. My three year old and two year old love them and always ask for 2nds! I make these every Saturday morning (per my husbands request) if your looking for a pankcake recipe this one is the best! Made the pancakes for the first time tonight! They are so fabulous!! All your extra pointers were perfect! Love them so much!! Thanks! So delicious, and glad to have pancakes back in my life occasionally!! Making these for dinner tonight and I’m blown away at how much they cook/look like conventional pancakes. I’ve snuck a taste and they are fabulous! Thank you! 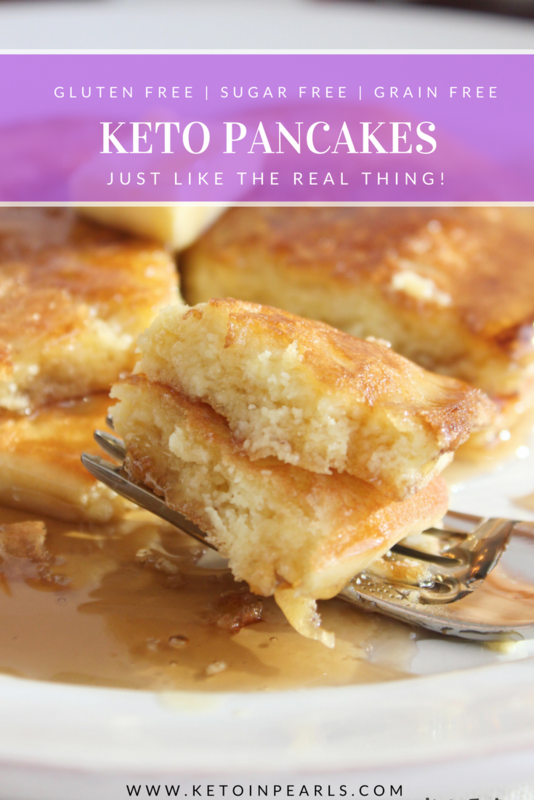 These are my fave keto pancakes!! — the only thing we do differently is add 2Tbsp half & half. And we we add mini chocolate chips to the kids’ pancakes. What kind of syrup do you use with this recipe? They look delicious I can’t wait to try! ❤❤❤Bless you!, These pancakes are amazing!! No more searching for the perfect pancake recipe! Being a pancake-a-holic & new to LCHF/Keto I am in pancake heaven! Now if I can just police myself into not making them every day!! Help, I’ve used the exact ingredients and there turing out crumbly. Hi! Inn so excited to make these! But I’m curious to know what sweetener you used? Did I miss that in your post? I use all Sukrin products. The 1:1 sweetener is granular and the Melis is the powdered. Either will work in this recipe. Best recipe EVER!!! I have just made this and I they came out great. I’ve tried quite a few pancake recipes and this one is by far, the BEST! Thank you so much for giving us a keto recipe that takes us back to childhood! Hi I don’t know if this is posted somewhere but I didn’t see it. What kind of sweetener did you use for this?! Thanks! Ever used Coconut Flour instead? I can only have 5 carbs per meal and this one has 8 per serving. Coconut flour is not a 1:1 substitute. You could not use it as a replacement for almond flour because it is much too dry. You can try my waffle recipe which contains coconut flour. This is the best keto pancake recipe by far!!!! I used these to make silver dollar pancakes to use for breakfast sandwiches. Works perfect!!! OMG!!! Genius Idea – these would be perfect for a “McGriddle” replacement. I could brush the SF syrup on the inside and do Egg, cheese and Sausage patties. TY for suggesting that!!!! OMG! I just made these into pancake bites with turkey sausage. Cooked 350 degrees for 30 minutes. Made 10 bites! Absolutely delish! I enjoyed the keto pancakes though they turned out a little grainy. I used blanched almond flour & sifted it twice since I didn’t have the super fine almond flour. Did you use the super fine almond flour & how long do you blend the mixture until smooth? I like that this recipe uses simpler, more affordable ingredients with fewer carbs than the almond, coconut, & tapioca flour blend pancake recipes. I halved the recipe & made 2 1/2 medium-size pancakes. With the half pancake, I decided to experiment by adding about 2-3 tbsp of almond-coconut milk to thin the batter, & that half pancake did not taste as good, so you dare right – don’t deviate from the recipe. Lol. Thanks for sharing. 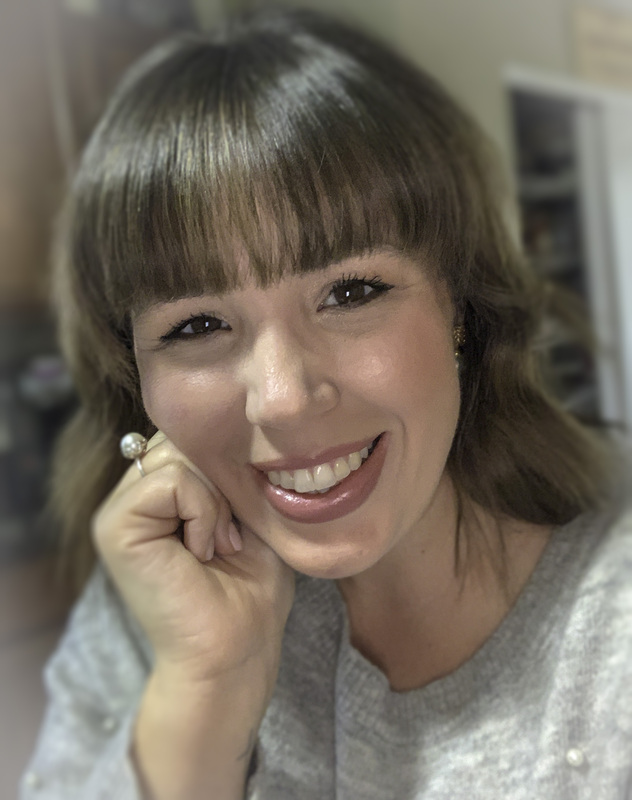 I am just beginning my keto journey, and you are my go-to for great recipes.! 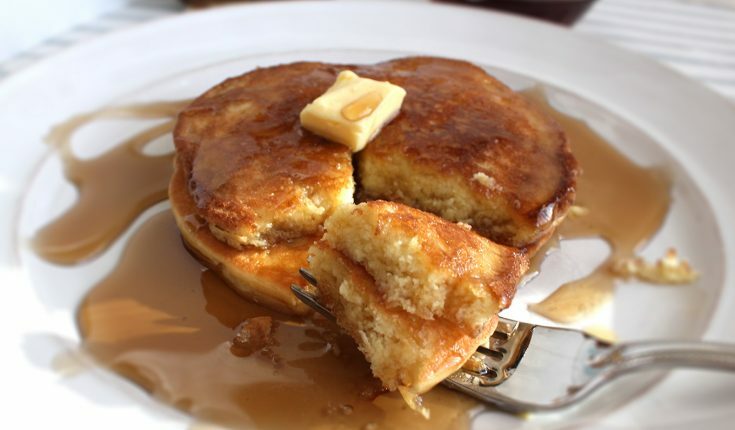 WHat is your favorite sweetener to use in the pancake recipe? I have found that your methods are perfect when I follow them, as written:) Happy Holidays! 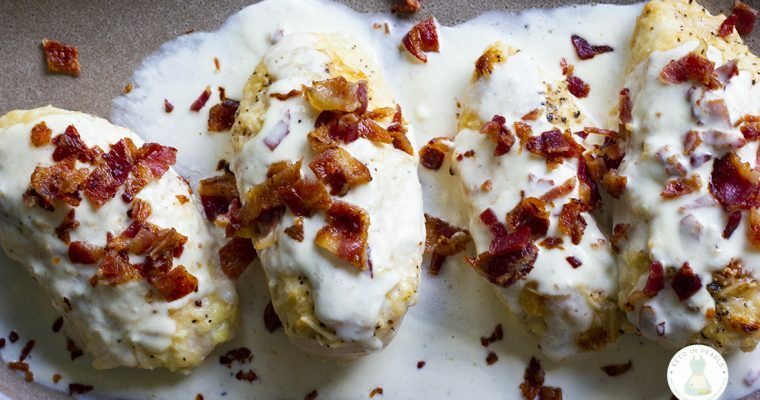 I’m reeeeeally interested in making these, but just wondering — how do you reheat them after freezing? And do you just toss them all in a plastic bag or container to freeze, or is there a better way? This would be a game changer for meal prep! Yes, I do this all the time. I like to put a little square of parchment paper in between each pancake so they don’t stick together in the freezer. Then to re-heat, I just microwave them about 30 seconds. I wonder if these could be made as a waffle? But I am excited about a pancake recipe that is easy to flip! PS when I clicked on your “Print this” option, it tried to print the entire post 22 pages!). I make them as waffles all the time. Or you can use my waffle recipe instead. I have been GF for years (health issues) and have spent a lot of money testing products to bake with. I am now trying the keto diet to lose some weight. So far I am very happy. My question is about sweeteners. I was wondering which are your favorites? For baking and raw? I am a very picky foodie and make everything from scratch. I am looking forward to trying your recipes. Thank you in advance. Do not alter this recipe!! I, unfortunately did and it was a disaster. I used 1 cup coconut flour and 1 cup paleo blend all nut flour and duck eggs. I could do nothing to save it. I may wait a bit before jumpin in and trying it again. I wasted a huge amount of costly ingredients. My fault. Looking forward to tasting them as they are supposed to be. I just made these, and they were AWESOME– very picky husband approved! Thanks so much for sharing! Wow! Just WOW! Love these pancakes, they turned out so goooood. Thank you for this recipe! I am always so hesitant to try keto pancake recipes because they almost always have an eggy texture, weird ingredients you don’t have on hand or taste BLAH…but I gave yours a try and BAM! They hit the spot in my tummy the right way! Thank you so much! By far the BEST pancakes I’ve had food Keto recipe! Thank you so much for sharing. Hi, I can’t wait to try these, but I have 2 questions, on step 2. It says Let batter 5 min. Before cooking? Let batter what? Also it says 2 Tbls. Sweetener butter for pan, what is sweetener butter. Sorry to sound dumb, but with all the warnings to make exactly like recipe, I don’t want to make a mistake! Thank you!! These are great!!! Oh my goodness I have tried 2 keto pancake mixes and 3 other recipes. I had given up on having decent pancakes on keto. Thank you so much for this recipe! I have made a few keto pancakes and thank the heavens I found this recipe!! It is the very neat I have made! I even deleted all my other recipes because I’ll never make anything but these delicious pancakes!’ They are that good!!! I just made these and I was in heaven! There is an almond flour taste, but it’s not over-powering, especially with the yummy ChocZero maple syrup. I also added 2 tbsp of HWC since my batter was thick. I was able to make 12 pancakes by using a heaping spoonful of batter. My 4-year-old granddaughter even loved them. I’m so happy I can finally eat the next best thing to actual pancakes. So I made the pancakes however they were so thick that I had to spoon out the batter.. can u tell me if that is how the batter should be.. also can u use olive oil? Instead of avacado oil? If you are reading this please know that you have finally found THE ONE in this recipe. Many pancake recipes make the claim, but are too eggy, too crumbly, too coconutty. The quest to regain enjoyment of weekend pancake breakfast ends with this recipe. Sooooo good!!!! Thank you! I was just curious if I could substitute extra virgin olive oil instead of the avocado oil? I cannot wait to make these! I made the cream cheese egg “pancakes” this morning and I couldn’t even choke them down. My dreams of delicious pancakes had been dashed….until I came across your recipe. Thanks for pioneering the way for other fellow pancake loving keto-ers. I made your fluffy pancakes, and complete mess!! I followed step by step your instructions and measure. Had to through the whole mix to the garbage.